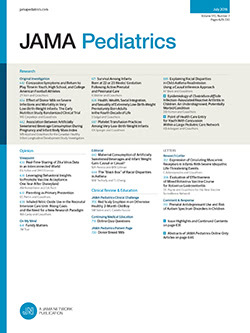 To the Editor In the article recently published in JAMA Pediatrics on a cluster randomized trial of the Healthy Buddies program, Santos and colleagues1 reported effect sizes for the impact of intervention on the assessed outcomes, with waist circumference and body mass index z scores serving as primary outcomes. The formula given for calculating each effect size was the difference between treatment and control groups in baseline to follow-up differences on the outcome measure divided by the pooled standard error of the measure. The use of a measure’s standard error for calculating an effect size is problematic for at least 2 reasons.